A twist to traditionally served idly chutney, here is another dish I prepared for bday celebration at home. When I saw them for the first time posted by a FB member on a food group, it was a visual treat and idlis never looked so appealing to me. Since then have been thinking and trying of recreating similar magic at home. After initial failed attempts, now I am happy that I managed to get them as you see in below pics, though chutney icing designs are still not upto the mark. I smeared the top of idlis with chutney and created designs using a fork. Hopefully with future attempts I should be able to do them perfectly with piping bags. We can use any other chutney such as tomato chutney, red chutney, roasted bell pepper chutney, mixture of hung curd and tomato sauce, chocolate sauce, chocolate glaze, etc as topping. Kids were thrilled to see these idlis dressed as cupcakes and hubby dear appreciated the efforts that went into making them! 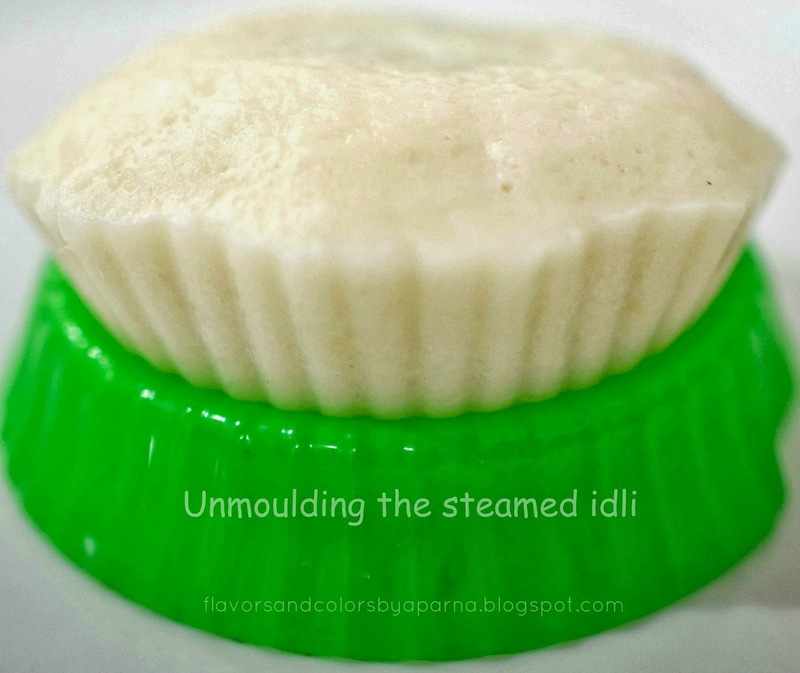 Pour the idli batter in individual muffin moulds and steam the batter in steamer/ cooker without whistle for 10-12 minutes. Switch off the flame and allow them to cool. Once they cool down, unmould the idlis and place them on a serving plate. Meanwhile, prepare the green chutney by grinding 3/4 cup grated coconut, 1/4 cup coriander leaves, fistful of mint leaves, 1 tsp grated ginger, 1 green chili, salt and very small piece of tamarind. Take care to use very little water while grinding it to fine paste. 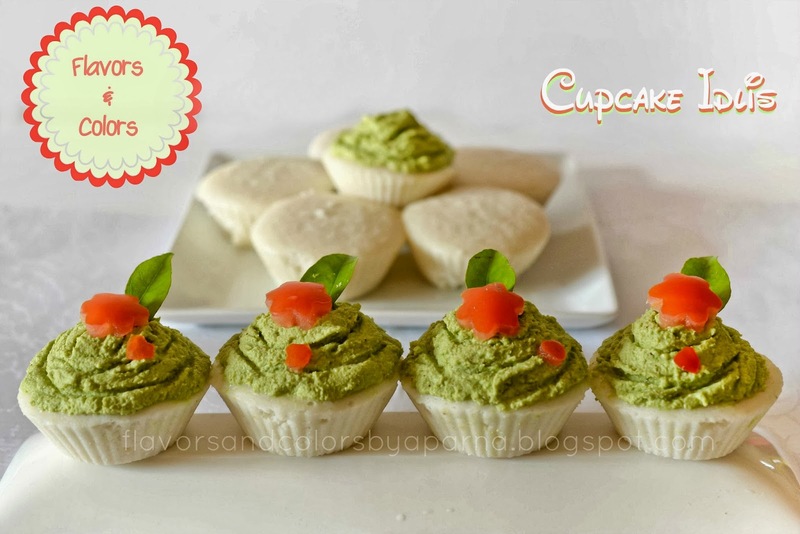 Smear the chutney on the top of cupcake idlis and create designs using fork. Garnish with a curry leaf and different shapes of tomato/ carrot slices. 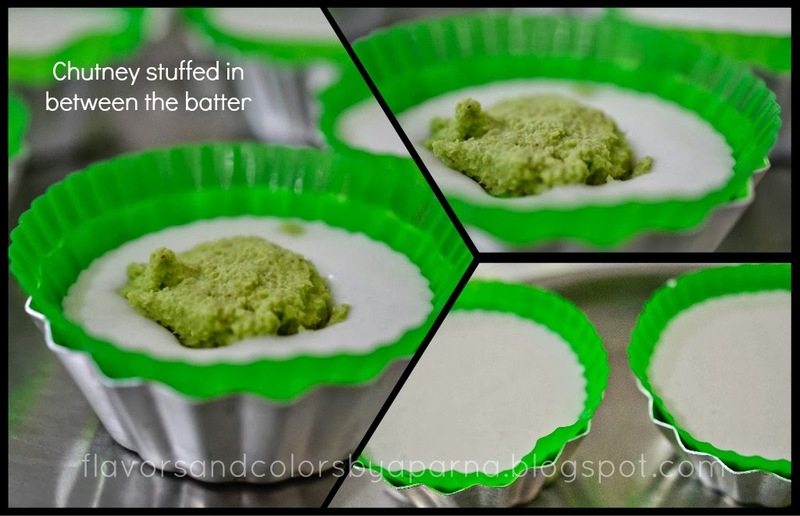 You can also use piping bag, fill it with the chutney or sauce and pipe out some designs as toppings for these cupcake idlis. 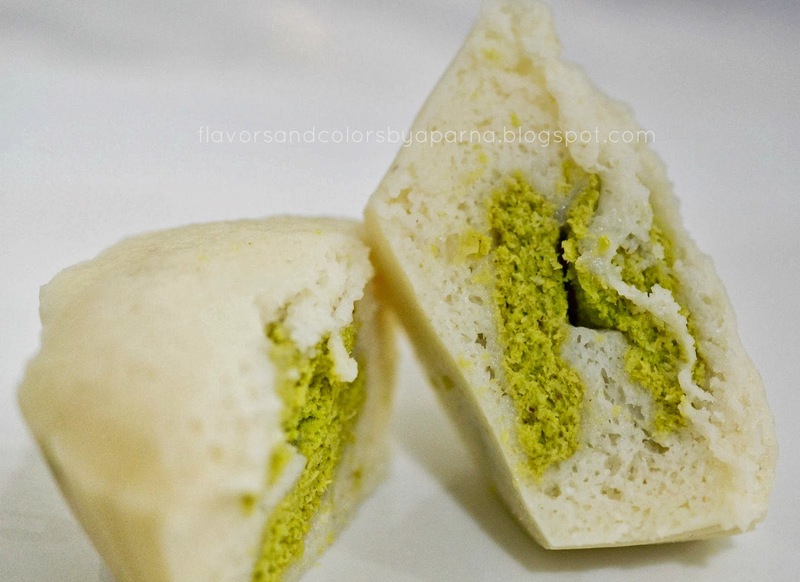 The idlis without icing were stuffed with chutney filling [shown in the below pic]. As a variation you can also use jam, chocochips for stuffing. 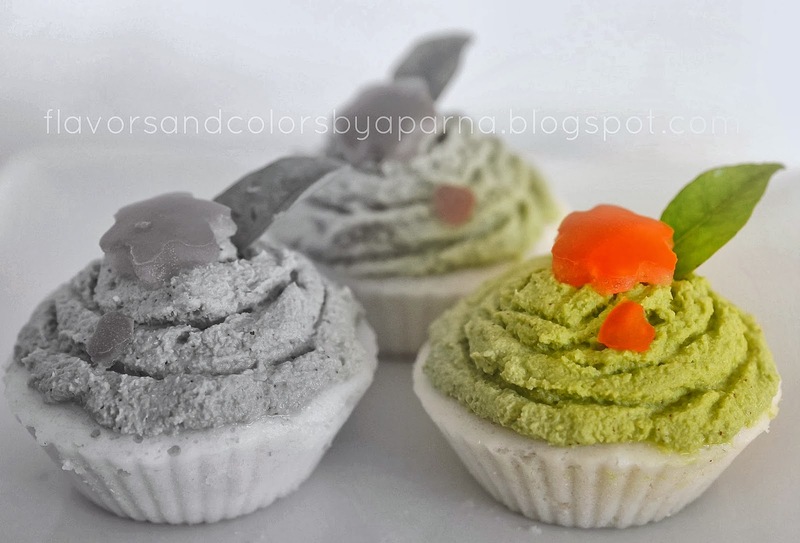 Next time I am planning to use rava idli batter instead of regular batter and stuff with sauted veggies. Oh the ideas are just pouring in ,,, but I will have to stop them as of now :D. If you come up with your own creative way of making them, let me know by leaving a message in the comment section below. Wow.. what a fantastic creativity... very very innovative...i have no words to say.. looks so lovely. Thnks Preetha Soumyan for your kind words,, happy hosting the event at ur space ! Very innovative they look excellent. Very innovative ideas to serve idlis. @Nayna : thnks dear for inspiring words .. happy hosting to u ...btw have u authored a book, felt like i came across ur name while browsing thru book during my India visit ? These look very cute :). Thanks for linking. this is soo soo creative..smart idea !! impressive. I'm not much of a cook but this is so creative, I might try it one day.